Stocks Have Slumped. Will Baseball Be Next? Soaring stocks and record home run seasons go hand-in-glove. What’s the secret behind this curious correlation, and what would the mood behind a bear market mean for the more-home-runs trend in baseball? Discover the answers in this interview with Alan Hall on WINA radio. "I can't believe it." "Who would have thought?" "Did you ever think we'd see THIS?" "I wish I'd seen THAT coming!" "That" could be anything. Radical politics. A crazy fad. Voter polarization. A sudden shift in purchasing behavior at your business. The emergence of a massive new industry. A war breaks out. Another ends in a truce. Whatever it is, any unforeseen change in our society's order can outrage you, shock you, awe you, present you with opportunities and risks. It can leave you searching for answers. What if you could have the answers -- objective, evidence-based, well-researched answers? Imagine scrolling through the news, nodding and saying, "THAT makes sense," and "THAT is right on time." Imagine becoming that unusual person who understands what truly drives today's events; who calmly anticipates change; who welcomes change -- to profit by it and to protect others from it. You CAN become this person -- by putting an exciting new behavioral approach at your fingertips. We call it, the Thinking Person's Membership. The new science of socionomics starts with a simple observation: How people FEEL influences how they will BEHAVE. At the Socionomics Institute, we look at how the whole society is feeling today -- so you can anticipate how society will behave tomorrow. Using various indicators, we track social mood in real time across the globe. 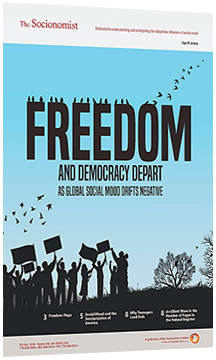 You'll see how the changing social mood drives shifts in everything from the songs people want to hear to the leaders they elect; from people's desire for peace to their hunger for scandals. This is a rare, awe-inspiring insight. It's what enables the Institute to help our members stay ahead of new trends that surprise almost everyone else. Your Thinking Person's Membership gives you this unrivaled perspective and puts you miles ahead of the herd. they are all powered by social mood; The Socionomist shows you how so you can prepare for what's ahead. No thinking person should be without this magazine. One-year subscription value: $300. The Wave Principle of Human Social Behavior (1999) - Learn how history unfolds in form-driven fractal waves. Value: $39. 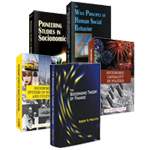 Pioneering Studies in Socionomics (2003) - Read a rich collection of case studies from 20+ years of research. Value: $39. The Socionomic Theory of Finance (2016) - How macroeconomics and finance really work - It's very different from what you learned in school! Value: $79. Socionomic Studies of Society and Culture (2017) - Discover how you can anticipate and capitalize on trends in pop culture and broader society. #1 Amazon social theory bestseller! Value: $35. Socionomic Causality in Politics (2017) - Grasp political trends in a new way by seeing exactly what propels them. Value: $35. You get a well-organized, full library of exclusive content. Plus, you get every new piece of content we release while you're a member, including any book and DVD in digital format, as soon as it's released; a virtual seat at any online event we host; a copy of any academic paper we release; and access to any available recording of speeches we make. Includes our Essential Mood Conference showcasing the most useful talk from the first seven years of the Institute's annual conference. The mainstream cannot bring you these insights. Not because they don't want to, but because they simply aren't equipped to do so. Try the Socionomics Membership for two months. Order by phone from 8 a.m. - 5 p.m. Eastern time Monday-Friday.